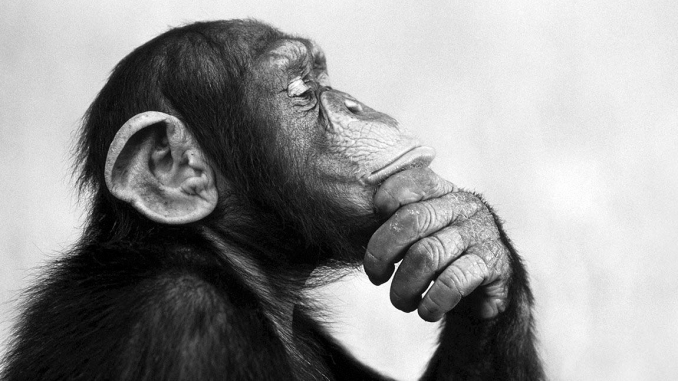 Below is a re-post of an essential blog, Re-thinking a “Safe Climate”: Have We Already Gone Too Far? by David Spratt, Co-Author of Climate Code Red: The Case for Emergency Action, (website: ClimateCodeRed.org). Additional bold added for emphasis by climateye. With Arctic sea-ice in a “death spiral”, Greenland in 2010 melting at an unprecedented rate, a seemingly extraordinary number of extreme climate events in the last year from the Russian fires to the Pakistan floods, and 18 countries setting new temperature records, have we already gone too far for a safe climate? “… the stability of sea level during the Holocene is a consequence of the fact that global temperature remained just below the level required to initiate the “albedo flip” mechanism on Greenland and West Antarctica. 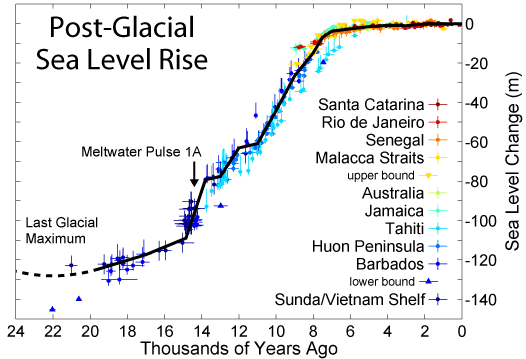 So what evidence do we have of Hansen’s and Sato view that sea-level rises will be non-linear? “These data records are too short to provide a reliable evaluation of the doubling time, but, such as they are, they yield a best fit doubling time for annual mass loss of 5-6 years for both Greenland and Antarctica, consistent with the approximate doubling of annual mass loss in the period 2003-2008. There is substantial variation among alternative analyses of the gravity field data, but all analyses have an increasing mass loss with time, providing at least a tentative indication that long-term ice loss mass will be non-linear…. We conclude that available data for the ice sheet mass change are consistent with our expectation of a non-linear response, but the data record is too short and uncertain to allow quantitative assessment. The opportunity for assessment will rapidly improve in coming years if high-precision gravity measurements are continued. 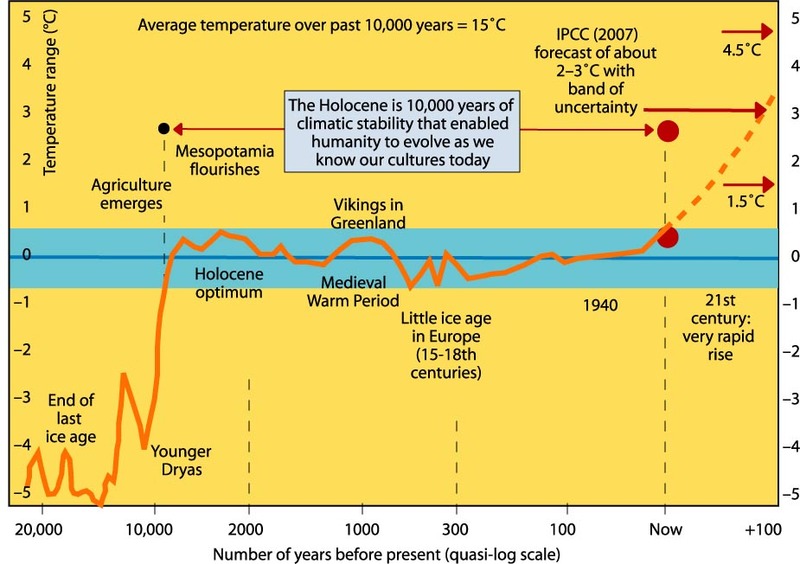 “… global temperature was only slightly higher in the Eemian and Holsteinian interglacial periods than in the Holocene, at most by about 1°C, but probably by only several tenths of a degree Celsius. Whilst atmospheric CO2 amount in the Pliocene is poorly known, a typical assumption, based on a variety of imprecise proxies, is 380 ppm, or less than today’s level!! 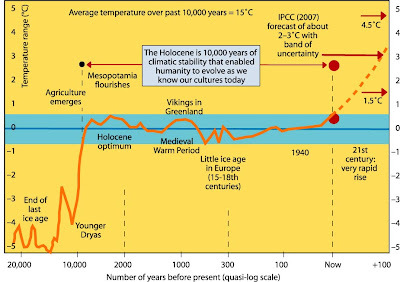 We are perhaps already a few tenths of a degree above the Holocene maximum, and the system seems to be in the early stages of rapid change. It is widely expected Arctic sea-ice will be totally lost in summer within a few years to a decade or so, perhaps at less than 1C or warming. Very few scientists think Greenland would be stable in an Arctic with little or no summer sea-ice, and opinion is split as to whether it is past its tipping point already.